Inlay work adds a distinguishing touch to your wood turnings! 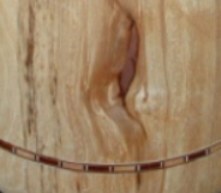 Adding some kind of inlay work is a good way to add color and excitement to your wood turning projects. It can be put in grooves or patterns that have been cut in the item intentionally or can be used in the natural holes and cracks found in the wood. At first I was filling the holes and cracks with CA glue but when my turnings were all finished it was obvious that something had been added in those places. It looked like a repair which I guess it really was. I then started saving the sanding dust from each piece and going back and filling in these places. This matched the color pretty well but not the grain lines. Therefore, it still looked like a repair. Not being happy with that “repaired look”, I decided that maybe drawing attention to those places would be just as well or even better than the “repaired look”. On Norfolk Island pine, there are usually small voids or cracks around the limbs because the tree itself grows faster than the limbs do. I decided this would be a good area to add some inlay work. In these places I added crushed turquoise stone powder. This gives the piece a very unique look. 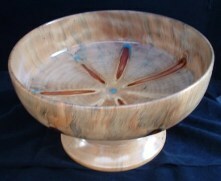 I have displayed and sold many turned items, made from many different species of wood with inlay work added. People seem to like the custom inlay look. Material for your inlay work comes in many forms, examples of a few are: crushed stone, crushed stone powder and even metal dust. It’s also available in several different colors. A friend lives in a town where there is a copper wire factory. He gets copper in a powder form from them. Unfortunately I have not seen this powder for sale. Luckily, he has given me a small supply. Because of its rarity, it has become a favorite custom inlay of mine and my customers. One way to get some free inlay material is to go to any location where they make keys. The grindings from the key machine will work great, and no, it’s not going to ruin your tools. Any of these materials can be held in place by using CA glue or epoxy. There are kits available which have everything that you need all in one box. Just pick your color. Packard Woodworks and Craft Supply both carry most of the types and colors needed for your inlay work. I am sure there are other suppliers also. When filling a hole or crack that goes all the way through your item, put a piece of masking tape on the opposite side to keep the inlay material from falling out. If the hole or crack is too deep(hopefully you’re not leaving your items this thick) you can first put some small wood chips from the pile, that I know you have, under your lathe in the hole to take up some of the space. This can save you money as some of the inlay material can be a little expensive. Crushed stone powder sells from $5.00 to $12.00 per ounce depending on the color. An ounce may not sound like a lot of material but it goes a long way. To avoid wasting the powder, I use a dentist tool which has a small spoon on one end to apply the inlay material. Inlay bandings are another form of an inlay. They are premade decorative wood strips; coming in sizes 1/8” to 3/4” in width and 36” in length. You can find them in both domestic and exotic woods in a variety of patterns. 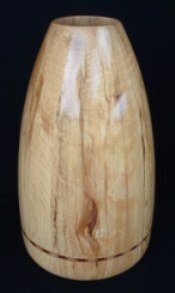 You can see the inlay banding that I added to this Sycamore urn. The bandings can be purchased from Woodcraft. They are easy to install. Cut a groove in your item to the width and the correct depth of the band that you have selected. This should be a tight fit requiring a light tap with a wooden mallet. Before applying wood glue to the groove, test fit one end of the strip. I don’t recommend that you cut the band to what you think is the proper length until the actual installation. Add glue to groove and install and tap the band into your groove continuing around the item leaving about one inch not tapped in. Overlap the extra length over the beginning point, mark with a pencil at the proper length so that when cut, both ends but together (it is better to figure a little long and cut twice then to be too short and have a gap). Place a thin piece of wood or plastic under your pencil mark to protect your piece and cut off excess banding using an exacto knife or similar tool. Tap in remaining end and wipe excess glue. I use a wire tie or hose clamp to hold the band in place until dry. The close up view pictured below shows that I used both copper powder and an inlay band.